Application: Leather bags and garments. These are metal beads with silver ant. finish. Available with different shapes and sizes. 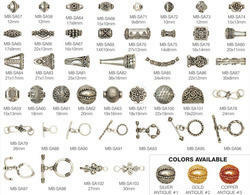 Available in different trendy shapes and sizes, these exquisite metal beads are made from superior metal. the card contains 43 different aluminium bead it has a variety of shapes. 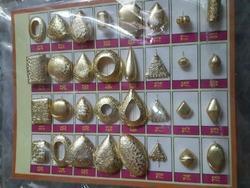 Many designs are available in metal beads to match the latest trend of fusion of antique, as well as, modern fashion. These beads are available in various finishes, shapes and sizes. Metals that we use for manufacturing these beads are brass, silver, nickel, copper etc. These beads are used in various jewellery items. We can please manufacture according your requirements from our above Bead Card. Parad Bead is used for protection. Parad as the most pure and auspicious metal according to our Ancient Vedas. Parad is also very useful in controlling various diseases viz. High Blood Pressure, Asthma. The Bead of parad wear in the finger as a form of ring. Metal Beads 2mm - Golden. Copper beads are available in various sizes and shapes, including round, oval, and other shape.. Copper bead is very durable and long lasting and it possess the property of good resistance to tarnishing. This is why copper beads are so much in demand.